Two-shot injection molding; a single-cycle process for multi-color, multi-durometer, multi-functional parts. Ready to consolidate your multi-component assembly into a single molded part? Use this two-shot design guide as your starting point. Simply fill out the form below and we’ll send a link to the guide to your inbox immediately! Is two-shot molding right for you? Two-shot, also referred to as dual-shot, dual-injection, double-shot, double-injection, multi-shot, 2k molding, and overmolding, isn’t nearly as convoluted as deciding what you’re going to call it. Whatever you choose, it’s a plastic injection molding process in which two different plastic resins are molded together in a single machining cycle. The two-shot molding process delivers a high level of accuracy and repeatability and reduces production steps, cycle times, and overall costs compared to traditional molding methods. It allows for complex, multi-durometer, multi-colored, molded parts without the use of secondary processes. It’s no wonder so many engineers are turning to two-shot for their complex molding needs. With decades of experience in multi-shot injection molding, we know that design is a key driver of the cost and quality of your part. Two-shot design has the power to give your company a competitive advantage or it can bring your project to a screeching halt. But where do you begin? What are the benefits of two-shot molding? Will two-shot injection molding even work for my part? What does the two-shot process look like? What special two-shot design considerations do I need to make? We were there once, too. That’s why we created this guide. 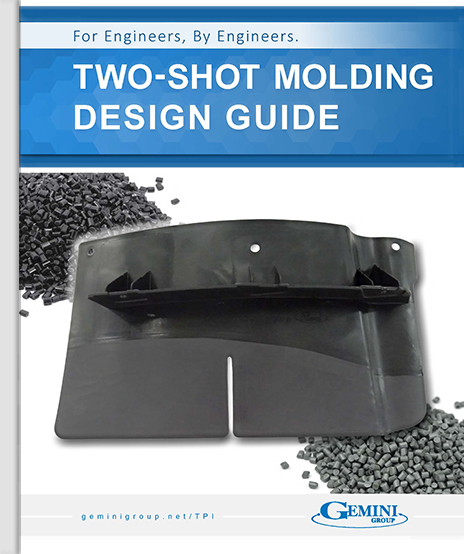 It provides the fundamentals of injection molding and basic guidelines for designing two-shot injection molded plastic parts – from the perspective of an experienced molder. It really is the next best thing to working directly with our two-shot team. But our team is just a click or phone call away, too! So, what are you waiting for? Get your copy today!